Have you ever dreamed of being present at two places at the same time??? Don’t get surprised by this as with the rate by which technologies are developing this dream will become a reality one day. 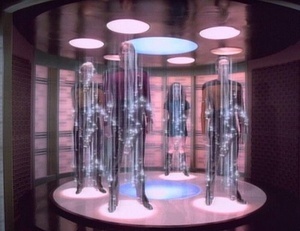 Teleportation is a phenomenon in which a beam of an object or a person is shown in another place by replicating its copy. Quantum teleportation is somehow different from simple teleportation and in this technique, two photons are entangled in such a way that if the state of one of them is altered then there will be alteration in the state of other one automatically as if they were connected with each other. Thus the information can be transported from one place to another. Scientists of Japan and Australia have used this technique and made a ‘teleporter’ and a ‘paradoxical cat’ with the help of which they are able to achieve a new breakthrough in communication field. The cat term is used to refer to the ‘wave packets’ of light which represents Schrodinger’s Cat, the famous thought experiment. Wave packets of light or we can say complex set of quantum information or quantum states have been successfully teleported from one place to another without actual transfer of a particle between them. Actually, a macroscopic beam of light was taken and a quantum superposition is applied on it and is teleported from one place to another. Superposition provides power to quantum computers, and in parallel processing, a same thing needs to be different (like one and zero) at different places. High fidelity transmission of a large amount of information like quantum encryption keys with a very high speed is now possible through communications networks. The greatest distance covered with the help of this technology is 143 km over the sea stretch which separates two Canary Islands. In simple terms, the information which is present in the form of light has been manipulated by destroying it in one spot and recreating at another place, so that it exists in two places at the same time.